Your pet’s overall health greatly depends on the health of their teeth and gums. 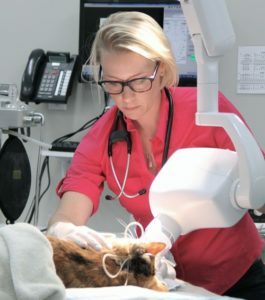 When we examine your pet’s mouth, we are checking for gum disease, tartar, broken teeth, retained baby teeth, an abnormal bite and signs of pain. In most cases periodontal disease is a preventable disease. We are happy to discuss all types of preventative oral health care, including brushing, oral rinses and specialized diets that really do help keep your pet’s teeth clean! Poor dental hygiene can lead to gingivitis and plaque buildup over time. This can lead to cavities, gum recession, bacterial contamination, loose teeth and root exposure. These conditions cause pain and can lead to problems with internal organs. At Central Animal Hospital, both Dr. Carey Keith and Dr. Trinity Smith have special training in veterinary dental care. Just like in your own dentist’s office, we perform digital dental X-rays to assess the entire mouth, both above and below the gum line. As periodontal disease is progressive, and most importantly in the beginning stages-reversible, we help make sure potential problems are taken care of before they become troublesome. Sometimes, the tooth is diseased to a point that the best thing for your pet is extraction of that tooth. Once a tooth has been identified as needing extraction through a dental exam and radiographs, we perform an intraoral local anesthetic block to numb the area. 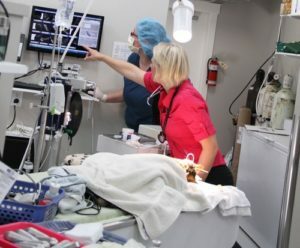 In doing so, it not only provides pain relief for hours after the procedure, it allows us to maintain general anesthesia with lower amounts of gas, making the overall procedure safer for your pet. This reduces complications, helps your pet recover faster, and gets them back to normal eating sooner. Your pet will be sent home home with several days of pain control to help them be as comfortable as possible. For more specialized dental care, including root canals, orthodontics and restorations, we are happy to refer to our local veterinary dentist, Dr. Theresa Jacobson.